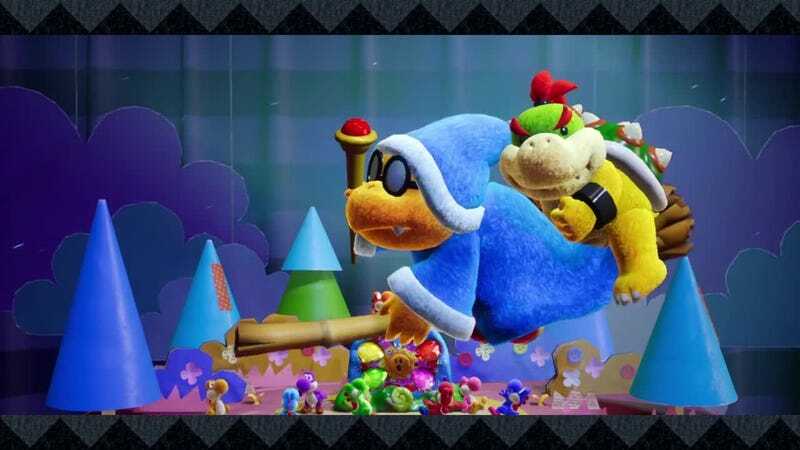 Is Kamek just Bowser Jr.’s babysitter? Yoshi’s Crafted World came out at the end of March and I have been blasting through it with my partner. It is colorful, fun, adorable, and relaxing, its aesthetic alone strong enough to keep us playing. Each new level in the game brings cute details highlighting Nintendo’s brilliant design choices for each thematic area - I LOVE the green straws standing in for bamboo, the inflatable cat balloon surprise, the Dino helmets, and much more. Sometimes looking at a level almost feels like a Where’s Waldo, there’s just so many hidden things to find and smile at. All of this makes it curious to me that people have complained about the difficulty. The game is certainly easy, but it does require effort, exploration, and thinking to get through. I think people who play a lot of video games sometimes forget that other people do not. My partner plays the occasional puzzle game on their phone, Mario Kart, and some FMV mystery games with me, but they haven’t played a platformer since the NES. Games don’t all have to be difficult, and just because something is easy doesn’t mean it doesn’t require focus and effort. My partner struggles on the boss fights but makes progress, dies to enemies and pits then learns to get past them, tries and then succeeds to understand the dynamics of differently structured levels. To them, the game is well balanced and fun and if it was harder we likely wouldn’t be playing it together. To me, someone who has played and beaten plenty of games with brutally hard platforming, the game is easy but due to the beautiful art style and simple but clever design choices I still love playing it. It’s relaxing for both of us and a winnable challenge for my partner. If the argument is that the game is fundamentally too easy and should have been made harder, I absolutely disagree. If you’re just asking for a hardmode, then yes that would have been possible to add in, but changing the basic game ideas to make it harder seems a lot more complex and denies the importance of a spectrum of difficulties. Kotaku’s recent article “An Easy Mode Has Never Ruined A Game”, which I 100% agree with, contains ideas that can also be applied to easy games in general. Easy games have a wider audience because most people do not generally play video games and can not play harder games. Therefore easy modes in games and the existence of easy games themselves is an important bridge to draw people into the world of video games and to make it accessible to larger audiences. Additionally, easy games offer a relaxing counterbalance to games we beat our heads against for hours on end. This whole discussion makes me wonder do people want all games to be the same? Don’t we want the largest possible variety in games? Don’t we want easy games to balance out the hard? Don’t we want Yoshis to balance out the Sekiros? Adding an easy mode to a hard game doesn’t change the fundamental nature of the game, just as adding a hard mode (while less important for reasons I’ve stated) wouldn’t change the fundamental nature of an easy game. But it seems people are arguing that, on a basic design level, Yoshi’s Crafted World should have just been made more difficult. To believe that is to deny the importance of diversity of challenge in games. In fact, having readily available games that are easy to play is more vital to gaming than difficult games because of their wider appeal. Yoshi’s Crafted World is a game for everyone: kids, gamers who want a relaxing side game, family members who don’t play games, people who don’t have the physical or mental acuity for most games, Yoshi fans, and more. It’s a beautiful, stylish, colorful, approachable game that provides a variety of gameplay ideas that most people can understand and learn in not too much time. Why would we want to change that? All hail adorable Frog King!